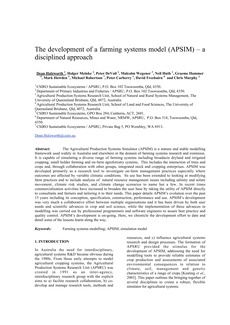 The Agricultural Production Systems Simulator (APSIM) is a mature and stable modelling framework used widely in Australia and elsewhere in the domain of farming systems research and extension. It is capable of simulating a diverse range of farming systems including broadacre dryland and irrigated cropping, small holder farming and on-farm agroforestry systems. This includes the interaction of trees and crops and, through collaboration with other groups, integrated stock and cropping enterprises. APSIM was developed primarily as a research tool to investigate on-farm management practices especially where outcomes are affected by variable climatic conditions. Its use has been extended to looking at modifying farm practices and to include analysis of natural resource management issues including salinity and solute movement, climate risk studies, and climate change scenarios to name but a few. In recent times commercialisation activities have increased to broaden the user base by taking the utility of APSIM directly to consultants and farmers and tailoring it to their needs. This paper details APSIM’s evolution over the past 15 years including its conception, specification, construction, performance and use. APSIM’s development was very much a collaborative effort between multiple organisations and it has been driven by both user needs and scientific advances in crop and soil science, while the implementation of these advances in modelling was carried out by professional programmers and software engineers to assure best practice and quality control. APSIM’s development is on-going. Here, we chronicle the development effort to date and detail some of the lessons learnt along the way.